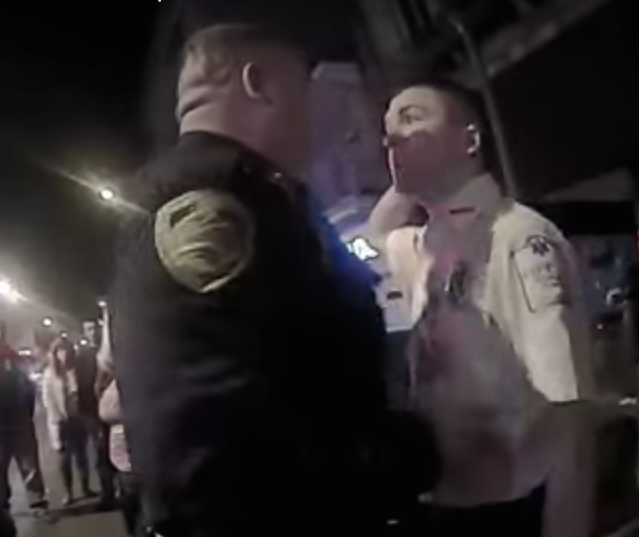 A bar fight in Downtown Portsmouth, Ohio Saturday night lead to a confrontation between a Portsmouth police officers and a member of a Life Medical Response ambulance crew that was caught, in part, on video. The portion of the dispute it does captures appears to show the officer with his hand at the EMS worker’s neck with the man’s back pushed up against a police cruiser. The Portsmouth police chief tells WSAZ-TV the incident is under routine administrative review but that the video only shows part of what happened. Life Medical Response told the TV station that it is working with police and will have more to say after the review. The official for Life Medical Response says the video has been heavily edited. The only people really talking at this point are those who say they witnessed the incident. WSAZ-TV’s interviews with the witnesses can be viewed here. The witnesses, including Trevor Conley, say the dispute between police and EMS started when a man injured in the fight came to and was agitated.